In this area, you will find tips, tricks and general information on the maintenance and repair of dental handpieces. Do you use after-market dental rotors for handpiece repair? Do you see changes in bur concentricity after just months? Maybe the guiding bushing is a problem! Bur concentricity in a dental handpiece will get worse over time as the rotor is being used by the dentist. The radial pressures that are put on the bur during operation will create wear in the guiding bushing, giving the bur more space to move radially. This radial play results in the dentist not being able to work as precisely with his/her handpiece. Additionally, increased play will reduce bearing lifetime. To reduce the wear in the guiding bushing, use a separate hardened bushing part, made of carbide or hardened steel. Many after-market producers of dental handpiece rotors combine the chuck and guiding bushing into one part to save costs. Although this does simplify the spindle design, it is not optimal for the bushing’s wear resistance. Make sure that your rotor supplier is using a separate hardened bushing! Do occassional internal cleaning of handpieces to increase handpiece lifetime! Regulatory requirements in many countries say that dental handpieces should be cleaned and sterilised between patients. Although these rules are often followed, the cleaning process usually only involves the outside of the handpiece. The inside of the handpiece is not often cleaned because, though sterilizing kills all becteria and germs, it does not remove dirt. Cleaning and sterilizing are totally different and exclusive processes. If you ever repaired a handpiece, you will know that a lot of dirt or contaminants do enter the head housing. The easiest way to effectively clean the inside of the handpiece is to use a specialized handpiece cleaner and can/coupling attachment. Alternatively, a number of new machines are currently being launched that will automate the cleaning and lubrication processes for dental handpieces. To get optimal handpiece lifetime between repairs, handpieces should be internally-cleaned regularly in operation, not just when they come for repair. Why should O-Rings be changed for every dental handpiece repair? Healthy o-rings are critical for good high-speed handpiece performance. Depending on the design of handpiece, the o-rings assembled in the head fulfill different functions: a) the axial setting of the bearings; b) vibration dampening; c) concentric operation of the cartridge in the head and d) frictional grip on the bearing outer-ring (this keeps the whole bearing from rotating in the head). 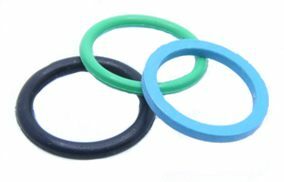 Dental o-rings can only hold their properties for a certain amount of time, given that they come in contact with different media (oil, cleaner, disinfectants) and are exposed to the tough environments found in washers, disinfectors or sterilizers. Oil, for example, leads to the expansion of o-ring material by 10% – 20% (depending on the exact material). This expansion can have a negative effect on dental bearing lifetime if it exerts too much pressure. Repeated thermal disinfection and sterilization damages the material properties and can lead to plastic deformation. In other words, the o-rings will eventually lose their ability to return to normal shape and do not anymore exert the forces they’re designed for. This means the vibration-damping effect is reduced and noise will increase. A good indicator of these property changes are o-rings that stick to the bearings, or o-rings that clearly have a flat surface on the inside. Therefore, my suggestion is to use only high-quality o-ring material and to change o-rings for every dental handpiece repair. Only this way, can a high-quality handpiece rotor maintain quiet operation over a long lifetime. It is important to properly seat a handpiece cartridge in the head of a high-speed handpiece before it is tested and re-used. This is especially true for older models but is also important for newer models. With many older high-speed handpiece models, the rotor assembly is only set in place with o-rings that create axial pressure between the two bearings. Newer models accomplish this with o-rings and more reliable spring washers. After replacing the handpiece rotor and assembling the back cap, use a smooth bur to put some relatively strong radial (sideways) and axial (direction of bur axis) pressure on a piece of brass. You could use a scale to measure 500g (1/2 pound) force in both directions. During and shortly after the axial test, check the handpiece back cap temperature with your thumb (just touch the back cap, don’t push it). If the back cap has quickly become warm or hot, it indicates that the distance between the cartridge assembly and back cap is too small. In this case, you should check and correct the position of the impeller and bearings. Using after-market cartridges for your dental handpiece repairs? Are your assemblies made from a hardened steel axis? A hardened steel axis will experience less wear on its inside diameter, where the pressure piece (part actuated by your thumb on the push button) and bur-holding chuck move constantly with the insertion and removal of a bur. This reduced wear keeps all of the components concentric and keeps bur runout low for a long period of time. Low bur runout means less vibration during operation and means longer bearing life. Another benefit of a hardened steel axis part is the ability to change dental bearings on your cartridge. On non-hardened steel axes, the critical diameter of the bearings seats will be damaged every time bearing are pressed on or removed from the axis. 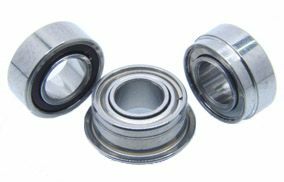 Dental bearings are so sensitive that even just one bearing change can damage the axis surface enough to reduce bearing life by up to 50%. 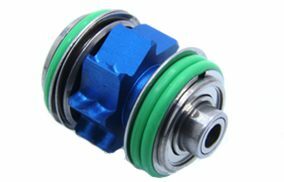 Using a hardened axis ensures that the bearing seat diameter stays constant, despite bearing changes. Make sure that the steel components in your handpiece rotors are hardened to at least 60 HRC.